At my next visit, the headstone was properly placed and I was able to confirm that it this was, in fact, where Feige is resting. A few things have bothered me since discovering the headstone. The inscription opened up more questions than it answered. The first of these questions pertains to Feige’s father. Who is this Ezriel Yosef Yehuda? I learned quickly from genealogical experts who weighed in with suggestions that the “haRav” in his title is not a designation of Rabbi, but a simple honorific of respect given upstanding male citizens. Now, three years later, I still haven’t been able to break through this brick wall and learn anything about her emigration from Europe to the United States. The names of “Feige Berman” and “Fanny Berman” are just too common, and immigration records are too sparse for me to find anything definitive yet. Her husband, Wolf Berman, remains an utter mystery. The name of Joseph matches the Yosef on the headstone. I have no reason to doubt this piece of information, but the name “Slobus” just doesn’t sound right. I’m not convinced that I have the correct information in my tree yet. Back to Feige’s headstone, the inscription also says, “Our beloved aunt and grandmother.” My tree covers the “grandmother” part of this inscription, but I have no clues on Feige’s status as an aunt, so I decided to do a little sleuthing to try to find her niece(s) or nephew(s). I am relatively confident that this would be her relationship, not her husband’s. Samuel had no brothers or sisters — that I know of. Because FamilySearch now has an index that includes the parents’ names on birth, marriage, and death certificates in New York City, that was my first stop. Dropping the “Slobus,” I looked for death certificates for individuals whose parents were Joseph and Malke. I also tried Joseph and Molly (Mollie), knowing that Molly is a popular Americanization of the name Malke. And I found an interesting hit in the results. Now, this could turn out to be a dead end, but it’s worth a shot: Chaie Sarah Stein died on 3 Feb 1931 in New York City. Her parents are listed in the index as Joseph Slawitz and Molly Ginsburg. All three were born in Russia, which is as specific as any other record related to Feige I’ve found so far. I’ve ordered a copy of her death certificate so I can view it myself, and I’ve also put in a request for a photograph of her headstone at Montefiore Cemetery on Long Island in case I can’t there to view it myself anytime soon. The name “Slawitz,” though, probably pronounced “SLAW-vitz,” sounds a lot like “Slobus” to me. It could have been the case that for the death certificate, the informant said the name Slawitz, and whoever wrote the information down just wrote what he or she heard, phonetically. Could Chaie Sarah be Feige’s sister? Could Chaie’s daughter or son be the person (or people) referred to by the inscription of “Aunt” on Feige’s headstone? 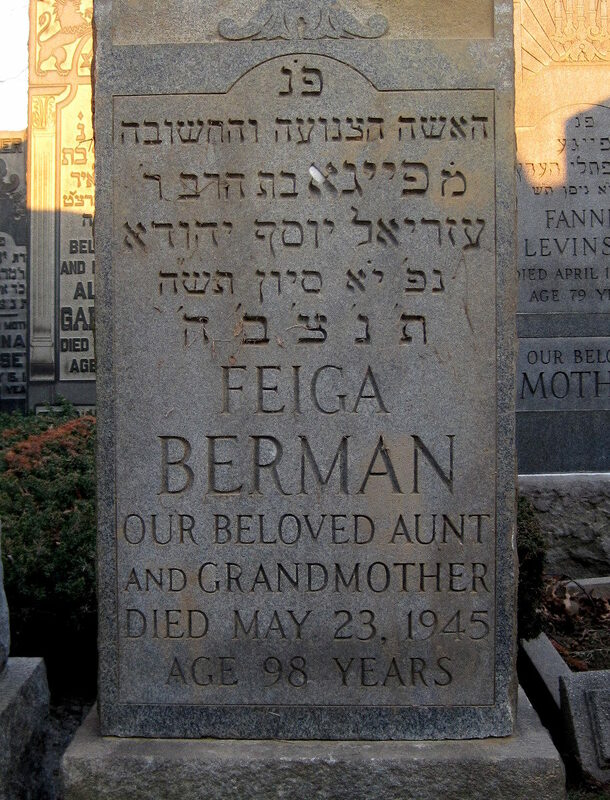 Feige’s headstone does not list the deceased as a sister — just an aunt and grandmother — and that conforms to the timing; if Feige’s sisters or brothers were still alive, she’d be noted as a sister on the headstone. Chaie did pass away before Feige, so that timing fits. Unfortunately, even if Feige’s maiden name was Slawitz (or Slowitz or Slavitz or Slovitz), finding more information about the family will not be any easier. It will be good if I can eventually add to the family tree, but information on Chaie Sarah Slawitz Stein is light as it is. Researching this family seems to be a brick wall, but like the other brick walls, I’ve been chipping away small pieces at a time, thinking I’m totally stuck, then coming up with another way to search to find information. The time I have for researching isn’t what it used to be, though. I was named after Feige Berman. Her name was Fanny I think in English. My Jewish (and I believe that’s Yiddish, not Hebrew) name is Feige (or Fayge how I used to spell it). My dad and grandmother called me Fagaleh 🙂 I was told she lived until 102 or 103 years old. Those names Stawitz, Slawvitz, Slobus sound more Polish to me than Russian. But I could be wrong – witz, vitz, also could be Russian. I’m sure you’ll come up with something. Previous PostPrevious Anna, my great grandmother, finally found.